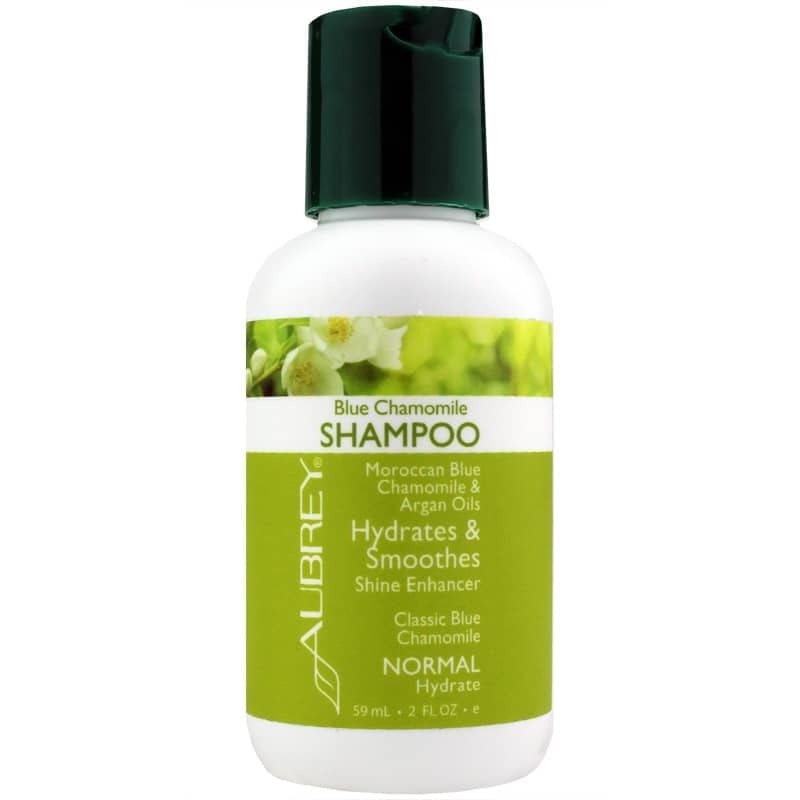 Nourish your hair with a blend of natural botanical extracts and oils from Blue Chamomile Shampoo by Aubrey Organics. The convenient 2 oz travel-sized formula includes soy protein, sunflower seed oil, vitamins C, E and F, grapefruit extract, and other ingredients that seek to support healthy looking hair. Organic blue chamomile oil provides moisture support and may maintain the natural shine of hair. Blue chamomile essential oil contains azulene, a deep blue-tinted, active organic compound. Chamomile, a cousin of the daisy, is often used in skin care products and in aromatherapy for its calming mood support. Organic Moroccan argan nut oil, which is rich in essential fatty acids, seeks to maintain soft hair texture. The formula in Blue Chamomile Shampoo also includes horsetail extract, which is believed to help support the strength of hair follicles. If you need botanically based, natural cleansing and shine support for your hair, try Blue Chamomile Shampoo by Aubrey Organics. 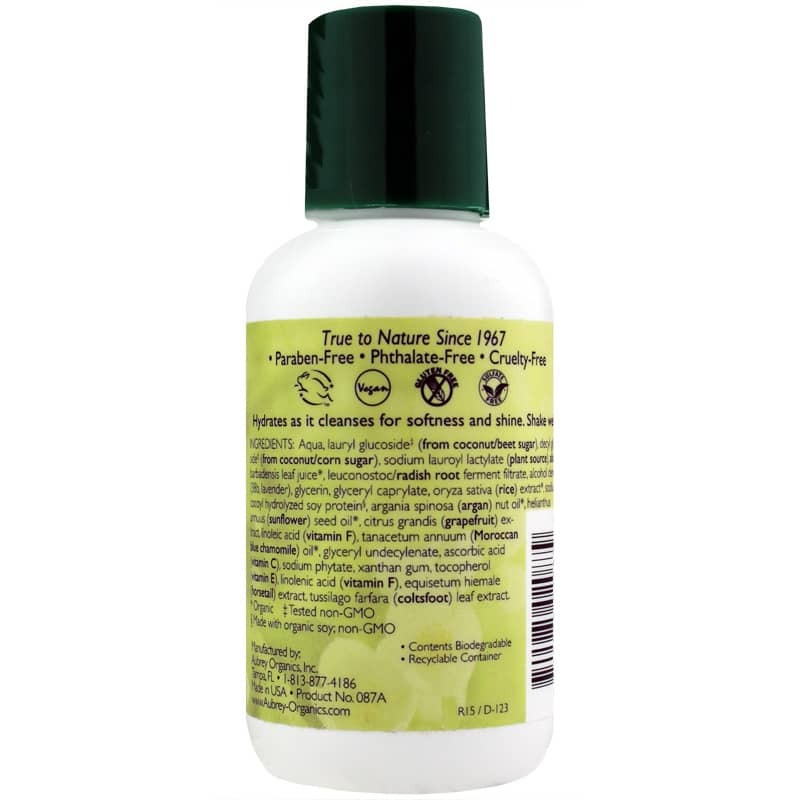 The 2 oz bottle fits perfectly in a purse or overnight bag, so you can travel with ease. Order today! Aqua, lauryl glucoside** (from coconut/beet sugar), decyl glucoside** (from coconut/corn sugar), sodium lauroyl lactylate (plant source), aloe barbadensis leaf juice*, leuconostoc/radish root ferment filtrate, alcohol denat. (38b, lavender), glycerin, glyceryl caprylate, oryza sativa (rice) extract*, sodium cocoyl hydrolyzed soy protein***, argania spinosa (argan) nut oil*, helianthus annuus (sunflower) seed oil*, citrus grandis (grapefruit) extract, linoleic acid (vitamin F), tanacetum annuum (Moroccan blue chamomile) oil*, glyceryl undecylenate, ascorbic acid (vitamin C), sodium phytate, xanthan gum, tocopherol (vitamin E), linolenic acid (vitamin F), equisetum hyemale (horsetail) extract, tussilago farfara (coltsfoot) leaf extract. This has been one of my favorites for a while. I use it on myself and my three year old. Super clean and shiny looking hair. I bought this for my daughter who had trouble with OTC shampoos. She loves the way it leaves her hair feeling clean, without drying it out or leaving a filmy residue on it.